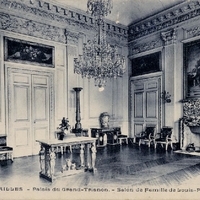 A postcard depicting King Louis Philippe I's family room in the Grand Trianon at Versailles, which was built in 1670 for King Louis XIV of France to allow his escape from the rigidity of court live in the main palace. "The Grand Trianon." Chateau de Versailles. http://en.chateauversailles.fr/grand-trianon-. “Palace of Grand-Trianon Postcard.” RICHES of Central Florida accessed April 19, 2019, https://richesmi.cah.ucf.edu/omeka/items/show/6605.